IS GREAT WRITER FREDDIE LEE SIRMANS SENIOR A TRUE GENIUS, OR JUST A PHONY ROCKING CHAIR THROWBACK NUT CASE? NOTE: USA culture, culture, culture, you can't depend on the young being considerate and thankful when they have never been conditioned to be considerate and thankful, its all culture, baby. F. L. SIRMANS LOG: 15 NOVEMBER 2017, 1210 HOURS. Folks, as a self-made writer I decided to do something I almost never do, do some soul searching and share my inner thoughts out loud. Making myself the issue to me is like wallowing in self-pity or being self-serving things I want no part of, but I make a very rare exception in this case. The die was cast for me way back when I was being physical punished for wetting the bed as a young child, that punishment saddled me with an over powering neurotic pitiful look that still haunts me to this day. No one can change the past, the wise thing to do is accept the hand you are dealt in life, learn to love and forgive then nothing can mentally destroy you. In life and in my writing so many people see me as selfish, hard, and uncaring but nothing could be farther from the real truth, it’s just that the will to survive is so strong in me. No one can wade through the internal troubles, sorrows, and battles that I have experienced and keep a positive outlook without being spiritual to the core, being religious and spiritual is not necessarily the same thing. Destiny or fate chooses you; it is not the other way around. If I could just wish away my neurotic symptoms it would be a God send, but I can’t, the morally weak and selfish sometimes takes the easy way out. I am a firm believer that taking ones own life is the ultimate selfish act. A truly unselfish person that could care less what happens to himself/herself is not going to bring shame and pain down on a love one or family members, its just not going to happen. There are many that would take the easy way out, but there are one or more human beings that they love too much to hurt in any way. Never mind me, my destiny is to survive and carry on my writing work. I know that my thinking and writing is out of phase with 95 percent of the USA population, still that doesn’t prove me wrong. Why do I continue to write and carry on? What fuels this urge and energy to write when so few reads my work? Finally, I have come to realize that it is my destiny to help save lives and my nation. Also, I believe there is no way without a purpose that I would still be walking this earth today without the protection of guardian angels. Now I will shift gears, Government should never be a permanent social and family provider, that role should be reserve for the nuclear family head of household, period. Government as a provider is like eating your seed corn, drinking your priming water, or eating your young. Western civilization cannot survive government being a family provider much longer. Government as a family provider has all but destroyed the USA and Western Europe. Right now, here in the USA the focus is to seize more money in the form of taxes to feed the insatiable appetite of our welfare state beast. And to do that the money can only come directly or indirectly from the profits generated by American private businesses. The #1 big problem is economic ignorance, before the “New deal” government as a free mass family provider never existed and was unheard of simply because it is dumb and leads to a dead end. And to put icing on the cake they enacted the arch-evil 1938 socialist minimum wage law too, duh. That really did it because that took all of the societal discipline out of our free market place economy, and stopped the boom and bust cycle from rotating. Sure, that was smart because everyone loves a boom cycle but hates the bust cycle and was happy the bust cycle was being staved off. But, now guess what, with no bust cycle, culture rot and moral decay has had nearly eighty years to hollow out the inner fabric of USA culture and moral values with no resistance to counter balance nutty out of control liberalism. And right now, I have serious doubts the USA will be able to recover and survive, especially as a free nation. Our USA culture and moral values are in almost total ruins and 95 percent of our population thinks the government owes them a living, which proves the old saying, "Ignorance is bliss", God help us. I would be surprised if USA business profits can feed the beast another five years without the USA economy totally collapsing, because everyday there are more mouths to be fed not less. Here we are today with the inner fabric of our culture and moral values hollowed out and no one seems to care or give a damn. I put most of the blame on liberals and liberalism, but a lot of good men/women of sound judgment and good character stood silent while the country went to hell in a hand-basket. Yet, we see government struggling with healthcare, taxes galore, and every other social and family provider issue under the sun while in the provider role, which government should never have been in, in the first place. The solution to me is very simple; the USA is not going to survive as a free nation if government continues as a social and family provider, period. I am just one lonely neurotic writer with an opinion, I have no power to decide anything, but that is just the way I see things. I know it may seem hard and cold but to save our individual freedom and our nation in my view all that is necessary is to just repeal the insane arch-evil 1938 socialist minimum wage law, period. Sure, there will be a lot of pain and hardship, but the USA will survive as a proud independent free nation, otherwise the “Iron fist” awaits us all and no one knows where that will land us. The only reason the liberals haven't seized control and used the "Iron Fist" already to have their way is because of our armed populace in this writer's view. You see what the "Iron Fist" is doing in Venezuela, and without our armed populace it could very well happen here in the USA. The liberals no longer willingly accept a peaceful change of governing power, and will stop at nothing to have their way. They still haven't accepted the 2016 legal presidential peaceful change of power and are fighting "Hook or Crook" to have their way and rewrite history. The liberals and establishment knows an armed populace will never let them use an "Iron Fist" to take over the USA. When the 1938 minimum wage law is repealed, there shouldn’t be any sudden changes; a genuine true free market place is all about discipline, balance, and control. A genuine true free market place operates on the boom and bust cycle that purges out all anti-survival extremes and nutty out of control liberal biases. And won’t let any insane anti-survival extreme get out of hand. A genuine true free market place economy is the only economic system known to man that will allow individual freedom and maintain an orderly disciplined society at the same time. A genuine true free market place economy will never fail if government doesn’t add wage and or price controls, because that will cripple and make weak every free market place economy. I still have serious doubts that the USA can recover from the severe destruction the 1938 minimum wage law has done to our culture and nuclear family foundation. It is simply impossible for the USA government to continue in its current social and family provider role without soon totally collapsing the USA economy. 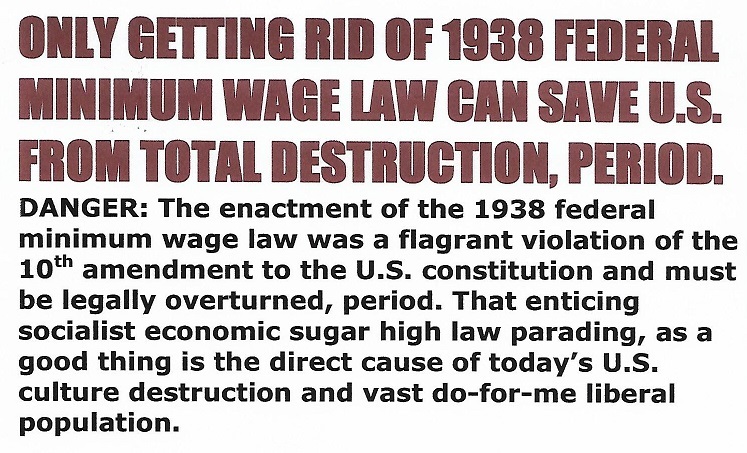 Repealing the 1938 minimum wage law will relieve the government of its provider role, because that will end inflation, then people will be able to pay their own food and medical bills with money that has real buying power. Otherwise to fail to repeal this arch-evil socialist law: It will be just a matter of time before the whole USA economy collapses, because the awesome financial load of the USA welfare state burden is becoming just too great, period. FREDDIE LEE SIRMANS SR. LOG: UPDATED 24 NOVEMBER 2017, 2215 HOURS.